brad efford on britny fox's "girlschool"
“I cannot conceive of any work of art as having a separate existence from life itself,” grumpy French genius Antonin Artaud famously wrote in The Theatre and Its Double, outing himself right from the jump as having never taught in a high school. Or maybe he did, for a bit, and his students absolutely despised him. Because what they don’t teach you when they teach you to teach is how performative the act of teaching truly is. More so than an actor, billed in garish font on posters outside the theater, giving interviews and managing the self as separate from the stage, spotlit in the expectation of lines and movements and emotional resonance—more so than the actor, the teacher must perform with crystalline puppet strings: fragile, invisible, uncertain. Even the moments of vulnerability must be a performance, as the teacher weighs how much to reveal, and to whom, and in what manner. There is no “life itself” at the front of the classroom, only art. My first teaching gig was at a boyschool for the middle grades, five through eight. I had just received my MFA and was gradually realizing/deciding that teaching post-secondary education was far more trouble financially, emotionally, and every other -ally than it was worth. The internet was a dark hole of opportunities that meant nothing to me, and I chose to apply to just about all of the wildest, figuring that at the very least being an obituary writer, or a dog washer, or a middle school Language Arts teacher would make for some good CNF down the road. Maybe I’d get a book out of it—I’d be like a younger, worse David Sedaris, who I didn’t particularly love in the first place. It was a weird time in my life. You see where this is going. My first year teaching middle school boys was a lesson in a million different things, a very small percentage of which turned out to be actually learnable. I was so green they could have mistaken me for a zucchini primed for harvest, and some did. I was well-loved and big-natured, making a splash early by coaching basketball and teaching lessons using hip-hop, but I didn’t get the stage directions. The performance was a struggle, and especially in discipline. It felt disingenuous of me to crack down within the boundaries and using the guidelines in which I had been told to crack down—it felt like I was just following my marks on the floor and reciting lines from out of the script. And for the most part, this is teaching. Performing a play that someone else has written and from which you gradually learn to tear out the pages you don’t like. Think of it a different way: if you are the soloist stepping forward for a turn, and the classroom full of pubescing not-adults is your audience, you’ve still got the melody running constant beneath you, both keeping you in time and holding you back. This isn’t free jazz, Smokey, this is teaching. There are rules. Who is she at the head of the classroom in the video for “Girlschool”? A performer putting on a performance in the guise of another performer, though yes, a different guild. We catch her finishing preparing for class, writing “J.S. 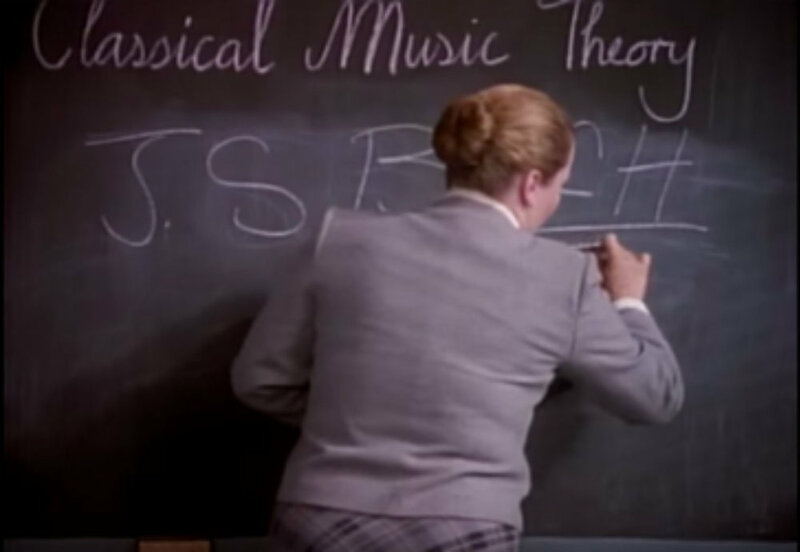 BACH” on the chalkboard beneath “Classical Music Theory,” which has been written with more care and in cursive. The header rests on clean board, the gray slate stone having been cleaned the evening before, before she turned out the lights and deep-sighed home. Bach’s name, though, she writes amidst a cloud of white residue left on the board from multiple erasings and rewritings and erasings. The teacher has taught this same lesson already today, and we know the performance she will give in teaching it now: write a composer’s name on the board, tell of that composer, erase said composer’s name from the board, and repeat. Even if she hasn’t taught this specific lesson before today, she has without a doubt taught innumerable lessons just like it. That’s what teaching is: writing, speaking, waiting, erasing, writing more. Sometimes I need to remind myself, with a forceful sort of consciousness, that there are people in this country who haven’t seen a marker and a whiteboard in years. I hide my whiteboard markers so other teachers won’t steal them when their own run dry. But what of the students? They too are playing a part, of course, though more by constrictive design and chemical change than choice. Most of them don’t even know their lines—most are first-timers at the Improv. They all wear uniforms here in this girlschool, like their teacher, costumes that have the part stitched right into the fabric. They are rebelling by design. I am unperturbed by the student who walks in listening to her Walkman; sometimes I teach an entire class to a student who’s kept one earbud in, and I consider this a win. This pupil of the girlschool, though, she leaves both sides attached, keeps her music on, as class begins. This is her performance today, the role of Teenager At School, and she’s been practicing. Teachers often make the mistake of assuming this practice is personal, though, and lose the empathetic edge as a result. Maybe they shout and feel shame all night for doing so. Maybe they grab a practiced pair of shears to snip the headphone wires in half. 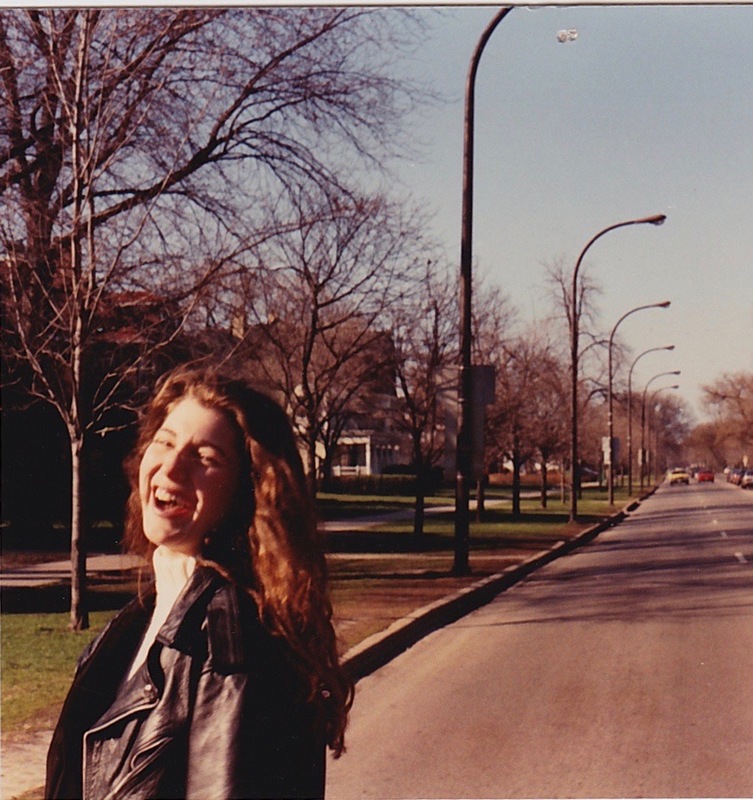 In “Girlschool,” the act of doing so splits reality. The chalkboard dissolves and glam rock snaps into its place, all leather pants, teased manes, capital-P Performance. The students, in response, snap out of it, turn genuine, agog. But when the teacher turns to see, the chalkboard resumes its state, Bach lesson still in stasis. In this moment, metaphor emerges, boredom made manifest in the state of hips swaying synchronized behind low-slung bedazzled Les Pauls. The students understand, they see the music around them, wait itching for school to fall away and for escape to replace its sad reality. The teacher has no idea, can’t even see desire as it wails siren-like around her. I feel for both. I have played both parts, both victim and villain. There is magic in watching a teacher’s performance break down in the face of unexpected circumstances, and there is trauma there, too. Sometimes students don’t know what to do—their partner has gone off-script and the director won’t say cut. The morning after the election of Donald Trump to the American presidency, I scrapped my lesson plans. Each class, one by one, all day, we just talked. I had no gifts for my students, no wisdom to impart. I probably cried; I’m sure of it. One of my students had recently come out to her family, and to us, and the bravest thing I ever saw her do was show up to school that day, tear-choked but defiant in her very presence. There was little precedence for this sort of thing—we were actors on a smoke break, shivering in the back alley, barely speaking. Eventually, the band breaks through to the classroom in “Girlschool,” becoming so overwhelming a force that even the teacher must acknowledge their bombast. The drummer drums patterns on the desk, the lead guitarist shredding atop it as if it were a Marshall. The teacher, God bless her, she lets go: her eyes close, her face contorts into unselfconsciousness, she high-fives all around and rips her hair from its bun. For this, too, she is pure—for her joy, she is rewarded with only more of it. In every state of being, a teacher performs, for that is the job from every angle. But recognizing the role for what it is does not have to preclude a dogged devotion to its strictures. Lead with heart, and you will see heart reflected back at you. Try to keep the music out—the art so insistent on existing inseparable from life—and you may wind up the only one unable to hear it coming. Brad Efford is the founding editor of The RS 500, a music-writing project pairing each of Rolling Stone's 500 Greatest Albums of All Time with an original story or essay, and co-editor of Bad For You, a monthly junk food newsletter. He works with middle and high school students in Northern California.